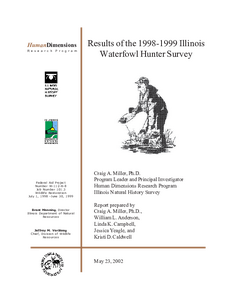 Description: Highlights from the results of the 2006-2007 Illinois Non-Resident Hunter Harvest Survey. 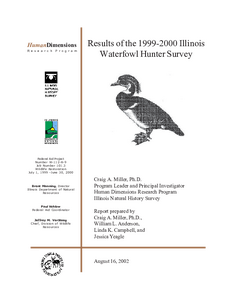 Description: Highlights of the 2007 Illinois Light Goose Hunter Survey. 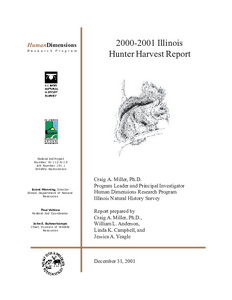 Description: Highlights of the results of the 2006-2007 Illinois Trapper Survey. 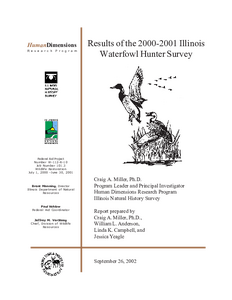 Description: Highlights of the 2006-2007 Illinois Waterfowl Hunter Survey. 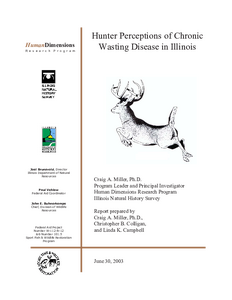 Description: A study of 2,683 (79% response) Illinois deer hunters attitudes toward and understanding of Chronic Wasting Disease (CWD) in white-tailed deer in Illinois was conducted during spring 2003. Most hunters (96%) were aware of CWD, but fewer could state they were aware of CWD in a particular state, including Illinois (77%). Higher risk ratings were given to West Nile Disease (7%), Lyme Disease (5%), or having a heart attack while hunting (5%) than CWD (3%). Hunters did perceive CWD to be a threat to the Illinois deer herd (33% were very concerned). Most hunters (63%) did not foresee any change in their hunting participation for the 2003 firearm season due to CWD, 15% planned to make sure they were hunting deer in a CWD-free county. A majority of hunters (54%) expressed a degree of uncertainty as to the potential risk of CWD to humans, and 18% felt it could be contracted by eating meat from infected animals. Hunters expressed potential changes in behavior with increased infection rates of CWD in deer in the county where they hunted. Based on the responses to this study, approximately 5% of hunters can be expected to drop out of deer hunting if CWD is found in the county next to or in the county where they hunt. Description: The Children and Family Justice Center of the Bluhm Legal Clinic of Northwestern School of Law, in partnership with the National Juvenile Defender Center supported by the MacArthur Foundations Models for Change program, conducted an assessment of access to counsel in Illinois juvenile justice system. This is the report of that assessment. 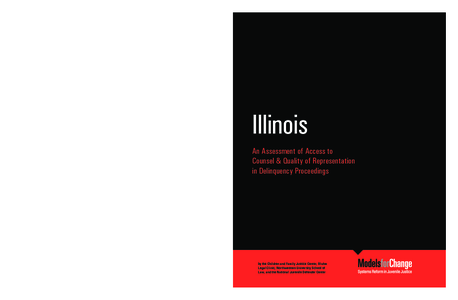 The goal of the Assessment is to examine the scope and quality of legal representation of accused children in juvenile courts throughout Illinois and to provide recommendations aimed at strengthening the quality of defender services for these children. 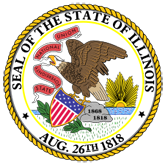 The Assessment is intended to stimulate discussion of the strengths and deficiencies in Illinois juvenile indigent defense systems and to serve as a tool for change. Description: An estimated 37,189 snow geese were harvested during the Light Goose Conservation Order season in Illinois in 2004. This harvest is 22% greater than the estimated 30,564 snow geese harvested in 2003. 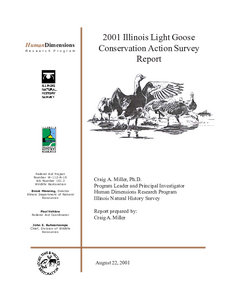 Participation in the Light Goose Conservation Order season increased from 3,111 hunters in 2003 to 5,976 hunters in 2004, a 92% increase. Similarly, the days spent afield by snow goose hunters increased 63%, from 27,177 days to 44,306 days. 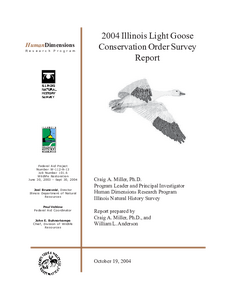 Sixty-three percent of the 2004 snow goose harvest occurred in the South Waterfowl Zone during February. Of the specialized methods afforded snow goose hunters, unplugged shotgun was the most often used, being employed by 67% of hunters. Electronic calls and hunting after sunset were utilized by 62% and 60% of the hunters, respectively. Description: A random sample of 5,182 waterfowl hunters in Illinois was selected from migratory bird hunters registered for the 1998 federal Harvest Information Program (HIP). 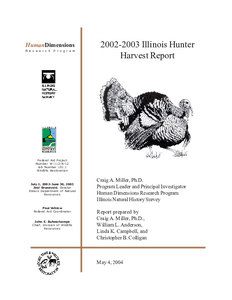 Hunters were mailed a self-administered, return mail questionnaire seeking information about hunting activities, harvest, and attitudes toward seasons for both duck and goose hunting. 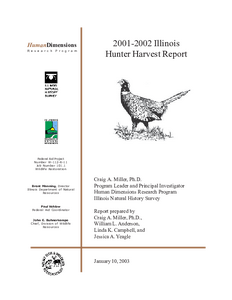 A total of 3,752 (72.4%) hunters responded, of which 2,264 purchased a 1998 Illinois Migratory Waterfowl stamp; 88.7% of these stamp purchasers hunted waterfowl in Illinois in 1998-99. During the 1998-99 season, 50,288 hunters took part in duck and/or goose hunting, spent 795,561 days afield, and harvested 471,072 birds. Duck hunters comprised 83% of the waterfowl hunting population, with 48% hunting ducks exclusively. Goose hunters made up 52% of the population, and 17% hunted geese only. A total of 10,307 hunters harvested 21,270 teal and spent 33,049 days afield. Duck hunters (n=41,755) spent 517,372 days afield and harvested an estimated 386,862 ducks. During the early September Canada goose season an estimated 11,981 hunters hunted 37,322 days and harvested 7,852 geese. During the regular Canada goose season 26,343 hunters spent 202,676 days afield and harvested 43,222 Canada geese. Adult hunters (n=3,343) took 5,142 youths afield during Youth Waterfowl Hunting Day. Hunters in all zones favored the early September Canada goose season. 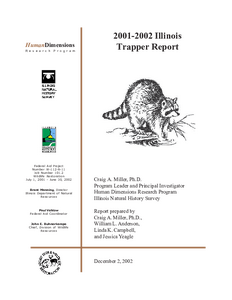 Hunters in the North and Central Zones favored extending statewide the telephone system for monitoring Canada goose harvest, whereas hunters in the South Zone favored leaving the system as it was at the time of the survey. North Zone hunters preferred 11 days for the first segment of the regular goose season, with a 14-day closed interval prior to the second season and a 21 day second season with no days for the second closed period. No opinion was the most frequent response for the second closed period. 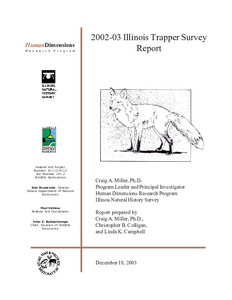 Central Zone hunters reported No opinion as their most frequent response to the same items. Hunters in the South Zone favored retaining the current (at the time of the survey) opening dates, and most hunters in the North and Central Zones had no opinion. 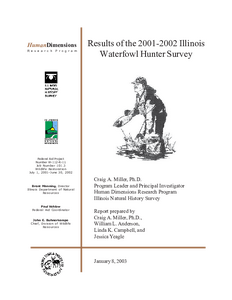 Hunters 2 in all zones favored shorter seasons with higher bag limits over longer seasons with lower bag limits. Hunters preferred September 11 as the opening date for September teal season and Thursday opener/Sunday closure for duck season. Hunters favored dates for 1998 duck season to be used again for the 1999 season. 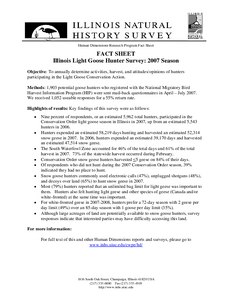 Description: A total of 3,160 (67%) Illinois waterfowl hunters responded to the 1999-2000 Illinois Waterfowl Hunter Survey. The number of hunters who hunted waterfowl during the 1999-2000 waterfowl season increased 15% from the previous season. 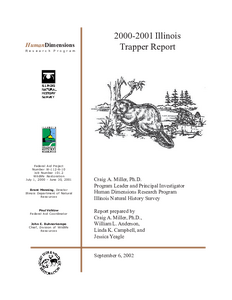 Hunters reported a record 1,472,301 days afield, an increase of 85% over the 795,561 days reported for the 1998-1999 license year. Waterfowl harvest increased 66% from 471,072 birds during 1998-1999 to 783,195 during 1999- 2000. Harvest estimates were as follows: 311,325 mallards, 69,930 wood ducks, and 181,650 other ducks. A total of 55,199 teal were harvested during the early September teal season. Goose hunters harvested 119,611 Canada geese during the regular Canada goose season. Description: The final response rate for Illinois waterfowl hunters to the 2000-2001 Illinois Waterfowl Hunter Survey was 1,857 (70.9%). Hunters reported spending 1,119,048 days afield, a decrease of 24% from the record high 1,472,301 days for the 1999-2000 license year. Waterfowl harvest decreased 10% from 783,195 birds during 1999-2000 to 708,092 during 2000-2001. Duck harvest estimates were as follows: 271,903 mallards, 58,604 wood ducks, and 166,834 other ducks. A total of 38,597 teal were harvested during the early September teal season. Goose hunters harvested 128,387 Canada geese during the regular Canada goose season. Description: Harvest of light geese during the 2001 conservation action was estimated at 36,830 geese, an increase over the 2000 harvest of 7,612. Participation increased to 4,665 hunters during 2001 compared to 865 hunters during 2000. Hunters spent an estimated 32,634 days afield during 2001, an increase of 4.9 times over the 6,643 days hunted during 2000. Hunting hour after sunset was the method used most often (63%); however unplugged shotguns and electronic calls were also used by approximately 50% of hunters (48% and 51%, respectively). As with hunters responding to the 2000 survey, hunters who did not participate in the conservation action reported no geese in the area and no place to hunt as the two main reasons they did not hunt light geese. Description: A total of 3,117 (66%) Illinois waterfowl hunters responded to the 2001-2002 Illinois Waterfowl Hunter Survey. Hunters reported spending 1,337,297 days afield, an increase of 20% from the 1,115,076 days expended during the 2000-2001 license year. The waterfowl harvest decreased 1.7% from 708,092 during 2000-2001 to 695,790 during 2001-2002. Duck harvest estimates were as follows: 305,180 mallards, 61,515 wood ducks, 167,883 other ducks, and 534,578 total ducks. A total of 36,013 teal were harvested during the early (September) teal season. Goose hunters harvested 64,907 Canada geese during the regular Canada goose season.